and communities, not just passive observers." The concept of student bus tour focused on the history of racist real estate practices in Kansas City was developed by Kansas City educator and community organizer Paul Richardson. The Strange Story of Integration in America . to the story of segregation, integration, and the failures of integration in Kansas City. story of segregation, integration, and the failures of integration in Kansas City. Click here for the Tour's Guide Book. Have students sit in groups. Ask them to read this excerpt quietly. Pass out a second version of the excerpt. Have students read the excerpt a second time together outloud. When they get to the bolded words or phrases have them look up the words in a dictionary or on their phones and write down what they find. How does looking up the words increase their understanding of the excerpt? How does reading it as a group and discussing increase understanding of the excerpt? Find more discussion questions here. Tanner Colby and Shomari Benton give an in depth explanation on why segregation in the housing industry in Kansas City has portrayed Troost as a dividing line between the middle class and poverty, white and black people, and what needs to be done to integrate communities not only surrounding Kansas City, but in other major cities that still deal with racial segregation. View video here. Discussion questions here. Place matters. Be it a street that divides the city or two neighboring counties, the place where one lives often strongly predicts income, educational opportunities and health outcomes. Take a look at the difference in two Kansas City zip codes that are only one mile apart. "The writer-in-residence at the Kansas City Repertory Theater has had a shift in perception since returning to town after stints in New York and Los Angeles, where he attended Juilliard and wrote for television respectively." Click here for full article. "To empower students and teachers with the tools to understand Kansas City and its peoples’ past, critique the present, and build for a better future through dialogue. " 2 to 3 facilitators will be provided to ride along with each school to help moderate conversations during the bus tour. Full Day Schedule linked here. Please click in and review. We will have printed copies on April 19th. Glenn North is a cherished Kansas City poet. He is the inaugural poet laureate of Kansas City’s 18th & Vine Jazz District, as well as a Cave Canem fellow, a Callaloo creative writing fellow, plus a recipient of the Charlotte Street Performing Artist Award and the Crystal Field Poetry Award. A committed teacher as well as student, he has worked extensively with urban youth, including as director of the Urban Transcendence Poetry Project, which included leading poetry and performance workshops, developing school curriculum, and editing the publication Urban Transcendence Poetry Magazine. His work has appeared in Kansas City Voices, One Shot Deal, The Sixth Surface, Caper Literary Journal, Cave Canem Anthology, The African American Review, and American Studies Journal. Tanner Colby is the author of Some of My Best Friends Are Black: The Strange Story of Integration in America, a narrative history of modern race-relations in the United States, which was nominated for the American Library Association's 2013 Andrew Carnegie Medal for Excellence in non-fiction.He is also the author of Belushi: A Biography and the New York Times bestseller, The Chris Farley Show: A Biography in Three Acts, and the coauthor of Remember the Time: Protecting Michael Jackson in His Final Days. He has written for Slate magazine on issues of race, politics, and culture. In 2015, Colby co-founded the podcast About Race with authors Bartunde Thurston & Raquel Cepeda and for two years they hosted lively -- honest discussions around culture, identity, politics, power, and privilege. He is currently a producer on the Daily Show with Trevor Noah. Nathan Louis Jackson is the playwright in residence at the KC Repthrough the Andrew W. Mellon Foundation National Playwright Residency Program grant. A Kansas City, Kansas native, he is a graduate of Washington High School. He is also an alum of Kansas State University and did his graduate work at The Juilliard School. His plays include Broke-ology (Lincoln Center 2009, KC Rep 2010), When I Come to Die (Lincoln Center in 2011, KC Rep 2014), and Sticky Traps (KC Rep 2015). He has twice won the Lorraine Hansberry Playwriting Award, is the recipient of the Mark Twain Comedy Playwriting Award, and was awarded the Kennedy Center’s Gold Medallion. He has written for television as well, with credits for Southland (NBC), Lights Out (FX), Shameless (Showtime), Resurrection (ABC), Luke Cage (Netflix) and n 13 Reasons Why (Netflix). His plays include Broke-ology (Lincoln Center 2009, KC Rep 2010), When I Come to Die (Lincoln Center in 2011, KC Rep 2014), and Sticky Traps (KC Rep 2015). He has received commissions from both Lincoln Center and The Roundabout Theater Company. At K-State, he was actively involved with the Ebony Theatre (as a director and as president) and participated in The Kennedy Center Summer Playwriting Intensive. He has twice won the Lorraine Hansberry Playwriting Award, is the recipient of the Mark Twain Comedy Playwriting Award, and was awarded the Kennedy Center’s Gold Medallion. He has written for television as well, with credits for Southland (NBC), Lights Out (FX), Shameless (Showtime), Resurrection (ABC), Luke Cage (Netflix) and 13 Reasons Why (Netflix). Tanner Colby is the author of Some of My Best Friends Are Black: The Strange Story of Integration in America, a narrative history of modern race-relations in the United States, which was nominated for the American Library Association's 2013 Andrew Carnegie Medal for Excellence in non-fiction.He is also the author of Belushi: A Biography and the New York Times bestseller, The Chris Farley Show: A Biography in Three Acts, and the coauthor of Remember the Time: Protecting Michael Jackson in His Final Days. He has written for Slate magazine on issues of race, politics, and culture. 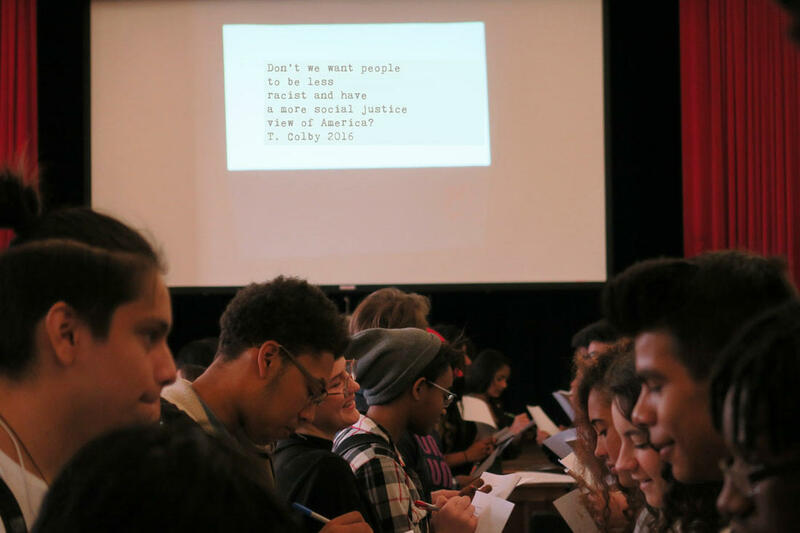 In 2015, Colby co-founded the podcast About Race with authors Bartunde Thurston & Raquel Cepeda and for two years they hosted lively -- honest discussions around culture, identity, politics, power, and privilege.